IN 1969 drive-in customers at the towns largest supermarket just couldn't believe their eyes. But the sign at the bay stated clearly: "This space is reserved for Helicopters." The manager of the supermarket Crazy Prices at Bow Street was adamant. He declared: "We don't rule out the possibility of a customer dropping out of the sky in his own private helicopter. For what other reason would we have provided the space?" IN 1969 boys from Lisnagarvey queued up to wash their teachers cars without the slightest sign of embarrassment. For each lad knew that despite the risk of leg-pulling by his mates it was worth it to raise money for a school minibus costing £1,000. The bus which held 20 pupils was to be used for extra-mural activities including transporting teams to sports events. Car washing was only a preliminary to a grand fete which was held in aid of the mini-bus fund in the school grounds. Acting as general co-ordinator was teacher Jim Mulholland. He first thought up the idea of the minibus. He explained at the time: 'A number of the big Secondary Schools have bought their own bus. I thought it would be a good idea if we made the effort too." Members of Hayloft Dart Club, who were based in Bridge Street, celebrate a successful season in the Assembly Rooms in 1958. The club won the Sportsman's Cup and McKeown Cup. 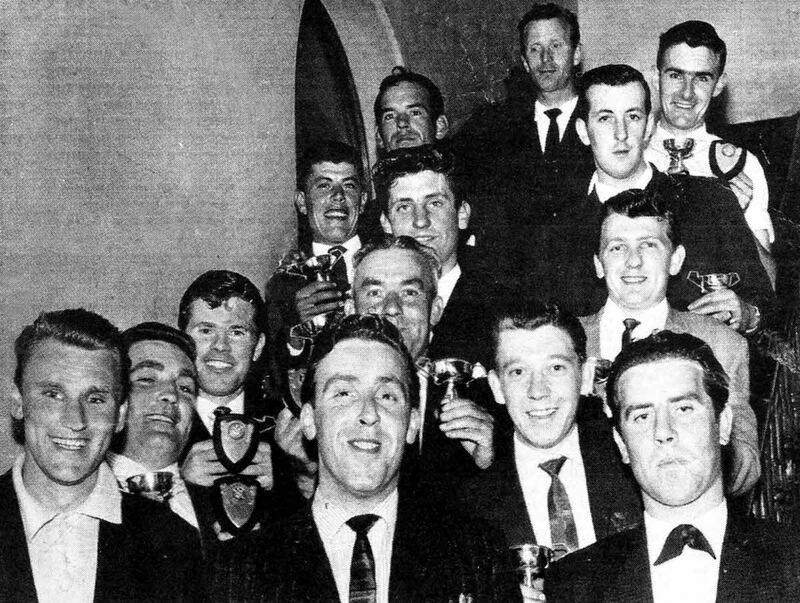 Maurice Leathem (front centre) was also awarded with the first Ulster Star trophy for Personality of the Year. The trophy was presented by Sam Kirkpatrick (back), the Star's darts correspondent. Luncheon in Lisburn Orange Hall between sessions of the half-yearly meeting of the Imperial Grand Black Chapter in June 1939, prior to the outbreak of the 2nd World War. (lt is believed to be the first time that this meeting was held in Lisburn Orange Hall). Included are Sir William Allen (Chairman), John D Barbour (Chairman of Lisburn Urban Council) and Sir Knts - R Briggs (DGM Liverpool and Provincial GM of England), H A Cushnie (Assistant Grand Registrar), Cecil Lowry-Corry (Grand Treasurer) and JA Barlowe (Assistant Grand Treasurer). 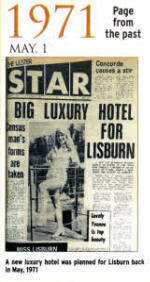 IN September 1971 Lisburn Orange Hall opened to allow local people the last opportunity of signing a Covenant of Loyalty to keep Northern Ireland British. Anyone over the age of 18, male or female, could sign and to meet the cost of production every signatory was asked to subscribe five new pence for which they received a document artistically and symbolically embellished. LISBURN'S new police chief, Superintendent Jim Willis, took up his appointment in 1986. A walk around local shops to sample Lisburn's atmosphere was one of the first jobs he did in sounding out the area he was to police. The end of a ten year smell saga? IN 1969 the Burnhouse smell saga which had been dragging on for 10 years, looked as if it was coming to an end. Early the following summer, Robert Wilson and Sons (Ulster) Ltd owners of the Burnhouse Animal Foods Products factory at Lissue, Lisburn planned to install a German odour control system. And after years of consultations and research by experts it seemed that the public who had to endure the smell could look forward to a final solution to the problem. Pressure to get rid of the problem had been brought to bear by both Lisburn Borough Council and Lisburn Rural Council over the years. The Borough Council had even sought legal advice on the matter and was soon after backed up by the Rural body. A thrilled Mrs. Linton said at the time: "I do hope that Burnhouse can proceed with the plan with all due speed. "Happy will be the day when the matter is finally cleared up."